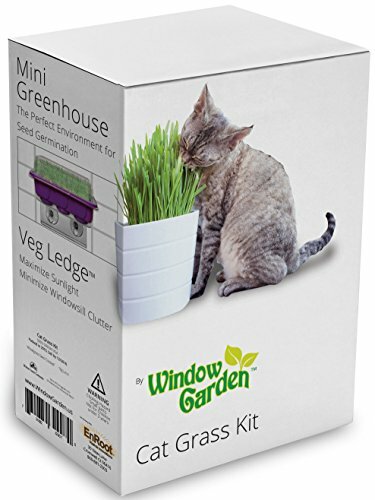 Window Garden Cat Grass Kit for Growing your Cat a Healthy Treat! Includes the Popular Space Saving Veg Ledge Suction Cup Window Shelf and Mini Greenhouse. Super Easy, Cat Lover Gift for All Ages. MINI GREENHOUSE - High Quality and Reusable, Creates the Perfect Environment to Germinate Seed for Growing Cat Grass Seed. SPONGEASE PERFECT POTTING SOIL - Expand it with Water and Spread Seed Over It, the Excellent Water Holding Capacity and Porous Fibers are Perfect for Growing Cat Grass. EVERYTHING YOU NEED - Grow Cat Grass with our Cat Grass Kit, its Complete, Inexpensive and Rewarding for All Ages. NEED A CAT LOVER GIFT? For Christmas, Birthdays, Moms, Dads, Students, Friends - Impressive From the Packaging to the Detailed Instructions - Sure to WOW! Growing cat grass is fun and highly nutritious for your cat. Great for all ages, get kids involved in growing a special treat for your cat. This cat grass kit has everything you need for successful cat grass growing with easy to follow and informative instructions. No need to buy different products like seeds or messy growing medium, you don't even need a windowsill, just stick the handy Veg Ledge to a window for maximum sunlight and when your cat grass is grown, just clip and serve or serve directly from the tray. Highly effective cat grass growing kit with premium packaging, graphics and instructions make this the perfect cat lover gift for Christmas, Birthdays, moms, dads, kids, friends, relatives and coworkers.